Recently I came across an old post which I never published, simply forgot about it. It might not be completely accurate, or even up to date. This was written just over a year ago and forgotten about. Not long ago I wrote about how the body makes it from the site of death to the hearse for the funeral. This is my follow up post on what happens once the coffin in loaded into the hearse. Once again I focus on the coffin and its immediate preparations. There is a lot of paperwork and other things going on at the same time which I do not cover. Yet this time I talk more about the staff and how they go about the job. This is so you can understand the feel of it better. Anyway, here's what happens after the coffin is loaded into the hearse. 1. Upon arriving in the morning the undertakers get coffee and then a copy of the 'day sheet'. This piece of paper is all but vital to staff as it says what everyone is to do. It tells you not only what you are up to for the day, but what everyone else is up to. 2. The staff then break into the 'crews' they are working with today. Actually, this isn't that common, but they do usually discuss things with each other. To make sure everyone was on the same page. 3. Staff look up the destinations if they don't already know where to go. They also think about when they need to leave to be there on time. If they need to arrive early for a big or complex funeral. While the drivers are cleaning and organising their cars the coffin is being signed out of the mortuary and brought to the garage. 1. Cleaning is a big part of working funerals. Every morning all the cars going out are cleaned. The driver of the car is responsible for cleaning it. But others chip in to help if they have time. 2. The vehicles are then stocked for the day. Bottles of water, fresh tissues in the mourning cars, and so on. Here is when the driver checks the standard stock, as in the umbrellas, chairs, first aid kit and so on. If anything is missing the driver finds a replacement (if there is one or time to get one). - This part takes anywhere from 20 to 45 minutes depending on how much work is needed and how fast the staff are. I tended to only take 20 minutes in the morning as I cleaned the interior of my car after every time it was used. Personally this was better than cleaning the interior as well in the morning, although others have different styles and it is harder to find time to clean outside mornings. This is done in the garage, or just before the coffin goes to the garage. 1. The coffin is wiped over. This is done to remove any condensation from being in the fridge, and to get any dust off. 2. The casket cover (flowers designed to sit on the lid of the coffin) are place on top then tied down. Different covers and coffins have different methods of being tied down. But it is generally done with two elastic bands on either side of the flowers. These elastic bands are attached to the flower base, the undertakers then hook them to the middle thumbscrews. 3. All paperwork is checked by the hearse driver. This includes the ID of the coffin and the flowers. Doing this means the right coffin goes to the right funeral with the right flowers. The hearse driver will load the coffin, usually with the help of one or more staff. But it is the driver who is responsible for everything within the hearse. From the water and umbrellas to the flowers and coffin. It is the drivers job to make sure it's there and in good order. 1. Loading the coffin is a rather straightforward procedure really. The coffin is brought to the back of the hearse. The hearse driver takes the head end (which is furthest from the hearse). Next another staff member or two will take the foot end of the coffin. They lift the foot end and slide the coffin in, as it goes in the hearse driver lifts the head end. 2. Once in the driver will make sure the coffin is straight, then lock it into place with the gooseneck at the end. 3. Until it is time to leave for the funeral the hearse is then left with the back open and the coffin inside. - There are two main reasons for this. The first is to stop condensation building on the coffin and inside the hearse. As the coffin recently came out of the fridge it is cold, and condensation is not appreciated by many mourners (some get annoyed at the coffin being wet on a rainy day). The other reason is so everyone knows a the hearse has a coffin inside. Once you walk in the garage you know that hearse is loaded up. After getting changed into the funeral suit. 1. The hearse driver will do one last check of the hearse, making sure everything is there and in good order. After this they close the back of the hearse, signalling they are ready to go. Once the back is closed they generally don't leave the hearse. 2. Next the conductor arrives, having checked over their end of the paperwork (as in having the Death Certificate and Cremation Certificate, any music to play and so on). 3. When both are ready the crew heads out. The conductor always rides shotgun, as a sign of importance and so they can see everything. 4. Finally they set off to the first stop. To get to this point takes anywhere between 15 minutes and an hour depending on when the funeral starts and how busy they are. 1. Depending on the drive the crew finally arrive at the funeral. Iff there are any mourning cars then they will have picked up their passengers by now. 2. When they arrive the staff jump out. The conductor will immediately go liase with family, clergy, celebrant, and anyone else immediately involved in the funeral. It is the conductors job to manage the people. Meanwhile the hearse driver will set up tables for people to sign the condolence book. 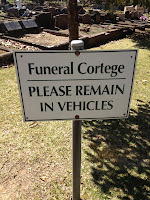 It is the hearse drive who is responsible for setting up tables and finding a way to get the coffin into the building. - In terms of authority on the funeral the conductor is the boss. They must know almost everything. Yet it is the hearse driver who most staff will talk with. While the conductor focuses on setting up music, talking with family or clergy the hearse driver sets up outside. 3. When it is time to bring the coffin in all the relevant staff assemble. The coffin can be brought in immediately after arriving, or after some time depending on the funeral. 4. The hearse driver will take the head end, the conductor will take the foot end or if they have enough people will lead. The other staff or mourners will take the middle spots. When the signal is given by the celebrant and conductor the coffin is taken out. It is brought up into the building. 5. As the coffin gets to the front the staff move off. Everyone except the hearse driver and one other staff member, be they the conductor or someone else predetermined. These two undertakers center the coffin in the middle of the room. 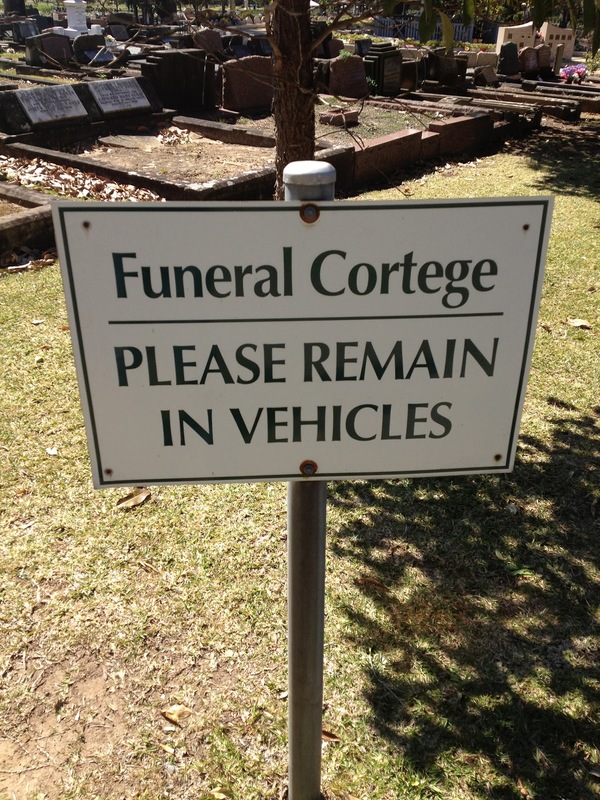 Next the hearse driver and conductor place anything on or near the coffin as required. Things such as the Pascal Candle for Catholic funerals, or specified flowers for non-denominational funerals. 6. Once done the hearse driver leaves, making their way back out to the tables. The conductor will generally stay inside and make sure everything is organised. Working out exactly who will carry the coffin, if there are specific instructions, if anything has changed and so on. After the funeral service starts the staff have little to do. Unless the undertakers are running something such as music, or a video then there's very little to do. Depending on the company of course, InvoCare for example are good at keeping staff busy and productive. The service might be a busy time for the mourners, but it is the quiet time undertakers look forward to. A time to relax behind the building. Sometimes staff will use this time to talk about the route to the cemetery or crematorium. Staff will also take this time to talk about how they are going to bring out the coffin. But it is generally time for a coffee and to chat. Staff also take this time to pack up the tables and condolence book. It is a nice quiet time so there is rarely the need to rush. Generally a funeral service takes 45 minutes. This is the same regardless of religion or culture of the funeral. Of course sometimes religion and culture can influence time. But for the most part one can bet a funeral service to take about 45 minutes. Small funerals are often quicker. Yet staff must always keep an eye on the funeral. Incase anything changes, it moves faster or slower than expected and so on. This is so staff can be ready when needed. At the right point, depending on religion and culture, the staff need to turn the coffin. The coffin always travels feet first. So it entered by the feet and is now facing the wrong way to come out. Or it entered by the feet and was turned to the side, so it is only half ready to be brought out. 1. Staff keep an eye on the funeral, when it is close to time they will make their way down the side discretely and wait. This is done in larger buildings so staff do not have to travel too far to reach the coffin. If they travel too far they might be too early or too late and look sloppy. 2. When the conductor or hearse driver gives the signal staff move down. They stop before reaching the coffin, then the hearse driver takes the head end and another staff member takes the head end. They paus again for effect, then proceed to turn. >> Details on how to turn a coffin (including diagrams). 1. After the coffin is turned it is time to carry it out. On most funerals the coffin will be wheeled, either to the door or to the hearse. On some funerals it will be carried from the alter. 2. Either way, once the coffin is at the hearse it will be loaded up. This is very similar to how it was loaded in the garage at the start of the day. With the hearse driver at the head end and conductor at the foot end (plus other people helping). 3. Once loaded the hearse driver and conductor will stand on either side of the coffin at the back of the hearse. They will stand with the hearse door open. All other staff are to stand behind or next to them until the door is closed. 4. When everyone has finished sprinkling holy water, or saying bye or whatever else they wish the hearse driver will close the door. This signals the other stuff to being the clean up. This is possibly one of the busiest moments for an undertaker. While mourners stand about outside, chatting and getting ready to go to the cemetery the undertakers are moving about packing up. 1. Any flowers from inside need to be places in and/or on the hearse. Unless instructed otherwise. 2. Specific items, such as music CDs, personal items placed on the coffin, religious objects and so on are collected and returned to the appropriate people or place. For example on a Catholic funeral the thurible is cleaned and returned to the sacristy here. Personal things the family had on or near the coffin are packed up and given back to the family. 3. The building is cleaned. Staff just do a quick check and throw away any bottles and other items (especially if they were handed out by the funeral company). This is just a bit of respect and help toward those who manage the building. 4. After all the running about the staff head back outside, some will turn on the air-conditioning in their car. The conductor should have talked with family and outer significant mourners about what is to happen next. 5. When the mourners are ready or it is time the conductor instructs mourners to their car and where to meet the hearse. 1. Everyone gets in the appropriate cars. Generally the closer to the hearse the closer the mourner is to the deceased. Although this is not a rule, more a guide if people are unsure. 2. Cortege drives to their next destination. Really not much more I can say about this. Other than the funeral industry drives very close together. Few other cortege groups will drive as tightly as a funeral cortege. As a hearse driver said, "keep up and keep close, so close that if I went over a cliff you'd go over to". 3. The conductor calls the cemetery or crematorium to let them know how long they will be. 1. When the cortege arrives at the cemetery they first need to exchange paperwork. The cortege will drive to the cemetery office and stop. The conductor will get out, go inside and swap papers with the cemetery. - Unfortunately mourners sometimes think this is the time to get out. But it isn't! They park their car, get out and watch the hearse drive off. Simply wait in the car until all funeral staff get out of the hearse or other cars. 2. Papers are swapped and the cortege makes its way to the grave. 3. At the grave the conductor and mourning car driver(s) will help the passengers in the mourning car. The conductor will then give some instructions, if necessary, before talking with the family to explain things. - Here is where the gravedigger will inform the undertakers if there is an issue with the grave. Say the grave has water at the bottom, or a root at the end or the next grave has collapsed. The undertakers need to know this and can either tell the family or plan accordingly. 4. The hearse driver will co-ordinate the unloading of flowers and other necessary items from the hearse. Anything requested to be by the graveside, from holy water to pictures. Often the gravedigger will also help (if it isn't a council run cemetery). 5. When time the coffin will be carried to the grave. The hearse driver will take the usual position at the head and the conductor at the foot. The coffin should be carried to the grave foot first, even if it is awkward. Sometimes the gravedigger(s) will help, if it isn't a council cemetery and the undertakers want help. - Unfortunately mourners say they will carry, then at the cemetery they change their mind or vanish. It isn't too common, but it is annoying. Realising the coffin is heavier than expected or the walk is far is not much of an excuse really. 6. The coffin is carried over, at the graveside the hearse driver will take their end and another staff member will take the other end. Just two people at this point. They then place the coffin on the edge of the grave while other staff reach over from the other side of the grave and pull the coffin to the centre. 7. The gravedigger makes sure the coffin is sitting correctly. 8. After another service (if there is another one, this is more common with religious funerals) the coffin is lowered. - Staff take one of the four ropes, lift the coffin and then another person (often a gravedigger) removed the bars that were holding the coffin up. The staff then lower the coffin. With an automatic lowering device the conductor will flip a switch, then stop it when it is far enough. 9. Petals or other things are dropped into the grave by mourners (if desired). 10. The cover is placed over the grave, signalling the end to the mourners. 1. The cortege arrives at the crematorium. The hearse and other official funeral cars will generally go straight to the appropriate chapel. Other cars will park in the car park provided. 2. The undertakers then set up the chapel, taking in any flowers or other specific items requested. Meanwhile the conductor or, quite often, another staff member will give paperwork to the office. 3. The coffin is carried in and placed on the catafalque. The hearse driver will make sure it is centered at the front of the chapel. 4. A service is held, mourners do their thing inside while the undertakers wait outside. Again the staff can relax but need to keep an eye on the service. Often there are cameras inside and somewhere nearby is a small room with a TV. This is meant as an 'overflow' room if there are too many mourners to fit into the chapel. But it is a nice place to keep an eye on the service without having to go inside. 5. When the service is finished the curtains are closed, concealing the coffin and signalling the end to the mourners. It's an interesting difference between how funerals run in different countries. In America it's fairly similar accept for some key differences, depending on location the body is either already at the place of service or sometimes they will come up with it and family in tow. Pall bearers are designated for this usually an active set of 8 and a honorary set of 8 who don't actually carry the casket. They don't skip out on carrying it and 9 times out of 10 funeral directors will generally have routes and things planned out from casket entrance to exit to the drive to the cemetery. Though never in my experience have I ever seen them exchange papers that is generally done before hand in the days before the funeral. Also it is not that uncommon in larger cities to have burials delayed a day or two, this can have multiple causes. The full process before and after a funeral is often unknown for the people who attend the funeral. Thank you from Starbuck Funeral Home for sharing this informative piece.